In this case only the outside geometry of the bearing is defined with inner diameter d, outer diameter D and width B. Additionally, the contact angle and the clearance have to be defined. The number and size of rolling elements are approximated by the software. The load capacities are then calculated using this inner geometry. This does not lead to accurate results, because the real bearing geometry is not used. But still influences of moment loads and other parameters could be seen. In this case, the inner geometry is approximated as before, but the load capacities are provided by the user. The load capacities are usually available in bearing catalogues. Using this selection, you have to enter all the dimensions for inner geometry. The load capacities are calculated according to the standards. Since bearing manufacturers often use load capacities larger than calculated according to standards, it is possible to enter both: the inner geometry and the load capacities. The load capacities are then used for the calculation of life. 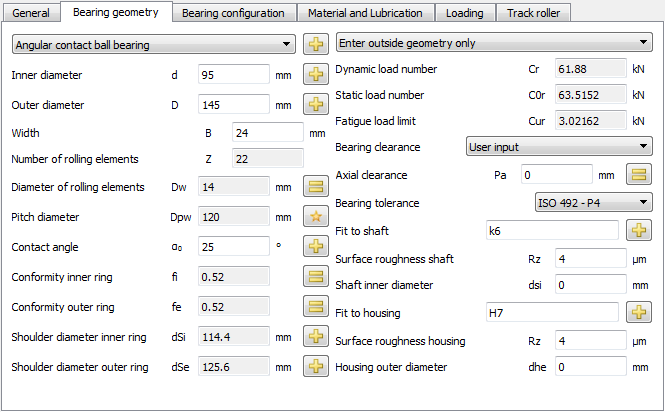 Instead of entering bearing geometry by the user, it can be selected from a database. Inner and outer diameter can be defined optionally. This restricts the number of bearings shown in the list. By clicking on the titles of the columns, the data can be selected according to this column. Double-clicking of a row reads in the bearing data and updates the values which are read from the database. The data of inner geometry of the bearings provided with the database are approximated from outer dimensions. Additional databases from bearing manufacturers are available. Catalog data with approximated inner geometry is available from SKF and Schaeffler and is included in the installation. Encrypted bearing databases including inner geometry are available from GMN and IBC, please contact the bearing manufacturer for these databases.